We all have our culinary strengths and weaknesses and I freely admit that making pastry is a major weakness of mine. It’s frustrating because I’m really comfortable cooking pretty much anything, but pastry always trips me up. It’s like I see the combination of butter, flour and a rolling pin and I immediately begin to panic and look for the emergency exits. As I’ve mentioned before, Matt has a real knack for baking and when he rolls out dough, he just gives it a stern British look and it knows to behave. Then when I try, it sticks, rips and clumps, leaving me covered in flour and wondering if frozen store-bought dough is that bad. The thing is, I refuse to give up trying. A well-made pie or tart is a thing of beauty and I’m determined to create them. While I haven’t mastered it yet, I have found a dough that works even if you completely and utterly destroy it while rolling it out. Now, I’m not saying I definitely did destroy this dough, but I’m not saying I didn’t. Let’s leave it there. But look! Here it is in all its crusty glory and it looks great (and tastes amazing). 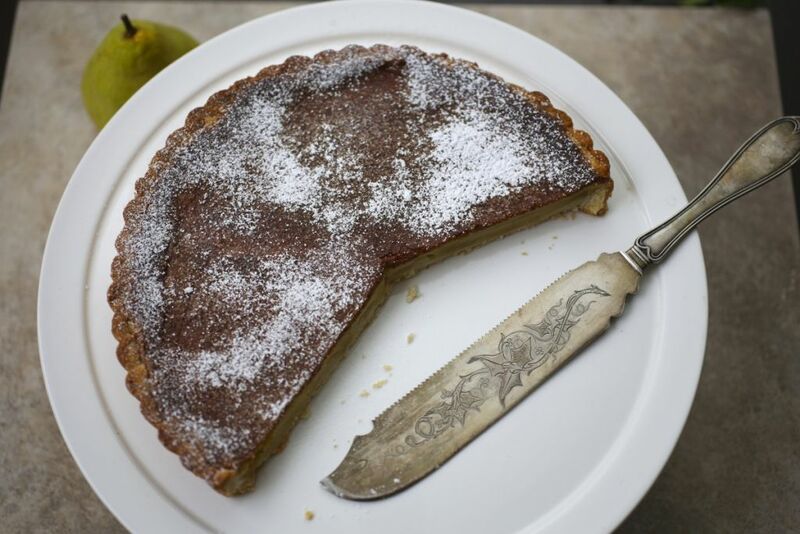 This is an incredibly easy tart to make which is perfect for holiday baking when you’ve got lots to do and don’t want to deal with a complicated project. I based it on this Williams-Sonoma recipe which, though lovely, was a little, um … cryptic with the instructions. When it comes to recipes, especially for baking, I need lots of details. You know, the devil and all that. So as well as clarifying a few steps, I also added ginger because I love the combination with pears but you could certainly use lemon or orange zest instead if ginger isn’t your thing. Another nice thing about this tart is that it’s super fancy-looking, so no one would suspect how simple it is to make. 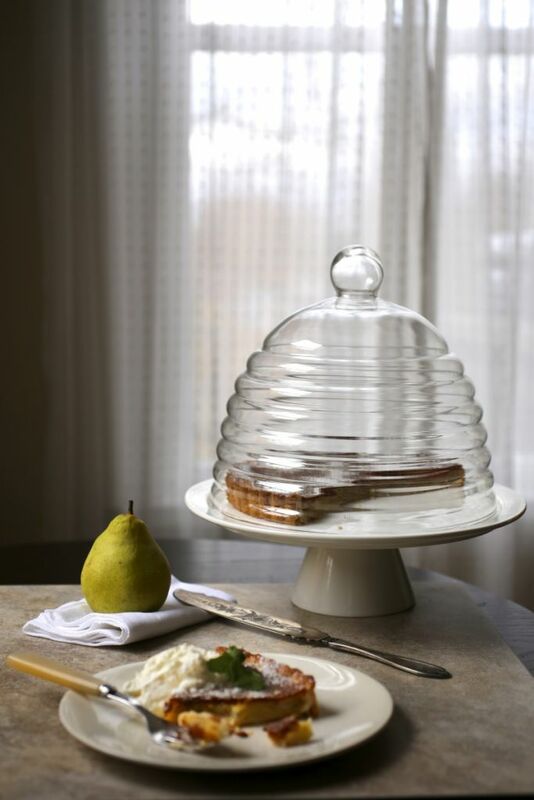 I think it would be a great addition to a Thanksgiving dessert table or any dinner party. 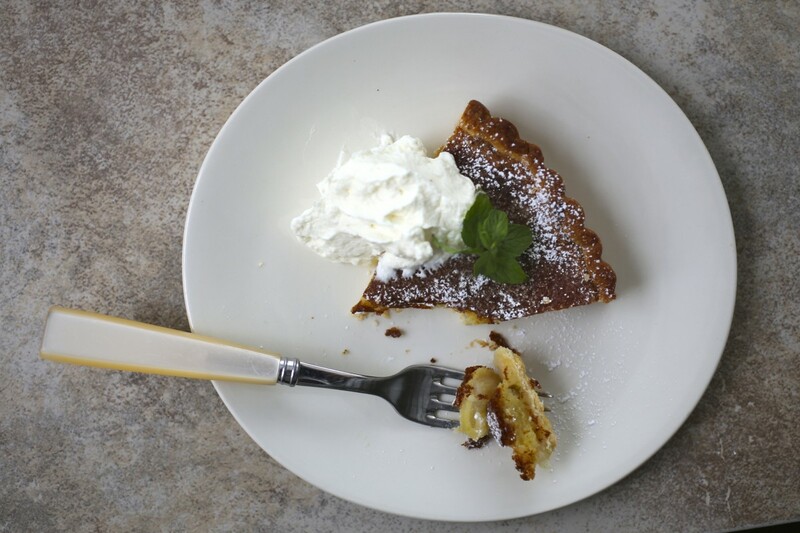 Especially after a big holiday meal, this light, elegant tart would be just the thing. In a food processor, combine the flour, confectioners’ sugar, salt and butter and pulse until the mixture forms coarse crumbs about the size of peas. Add the water a tablespoon at a time and process until fine crumbs form. When you squeeze a bit between your fingers it should just stick together. Transfer the dough to a work surface, and press dough into a flat disk. You will have about 1/3 more dough than you will need for this but save the extra for patching or to make another small tart. On a lightly floured surface, roll out the dough disk into a 10 1/2-inch round. Gently transfer the dough to a 9 1/2-inch tart pan with a removable bottom. Fold the overhang back over itself and press it into the sides of the pan to make a sturdy rim. If dough rips, just patch it together with your fingers and add a little of the leftover dough to make sure it’s thick enough. Don’t worry about it being pretty at this stage. Run your rolling pin over the top of the tart pan to clean up the top edge. 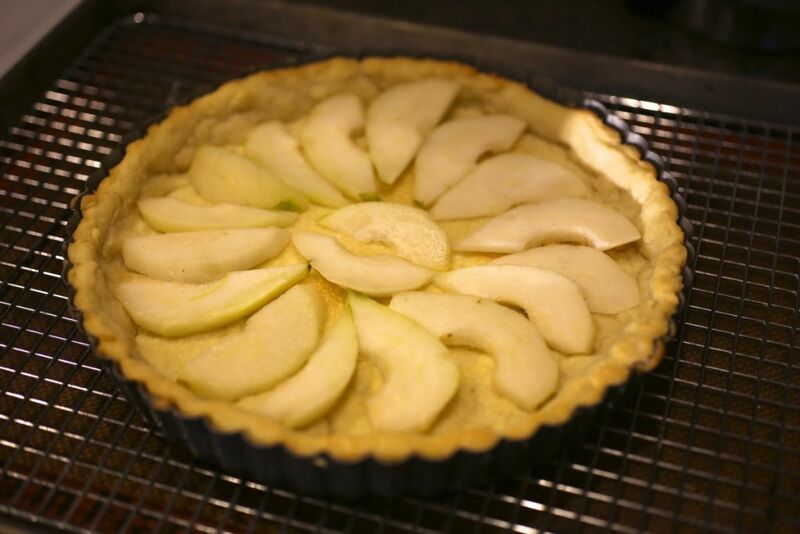 Freeze for 10 minutes then bake the tart shell until very lightly browned, 8 to 10 minutes. Transfer to a wire rack and let cool. Keep the oven at 425°F. Peel the pears, cut in half and, using a melon baller, scoop out and discard the core. Cut lengthwise into thin slices (you’ll get about 12 slices per pear). 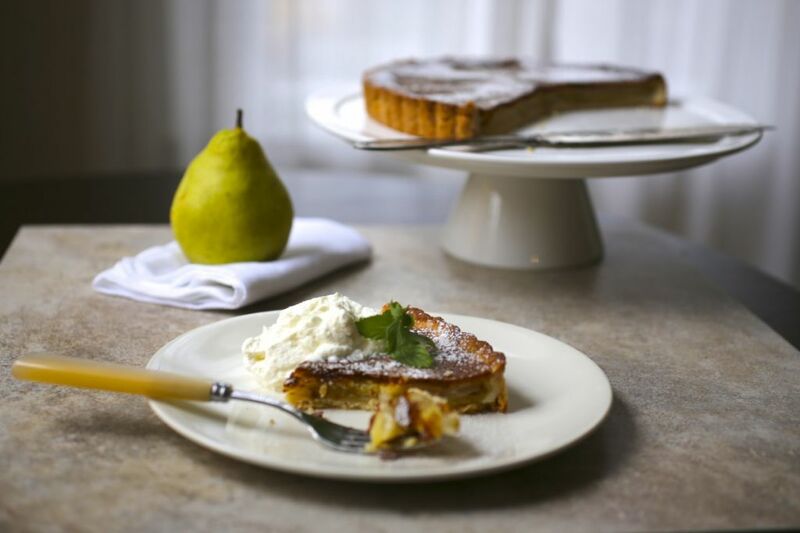 Arrange the pear slices in a circle in the partially baked tart shell. In a stand mixer with the whisk attachment, beat the eggs on medium speed until thick and pale in color, 3-5 minutes. (You could also use a bowl and an electric mixer though it may take a minute or two longer). The eggs should look like thin pancake batter at this stage. Beat in the sugar slowly. Add the butter, cream, ginger, flour and vanilla and beat well to combine. Pour the mixture evenly over the pears. Bake the tart for 15 minutes at 425°F. Reduce the oven temperature to 400°F and bake until the filling is set and the crust is golden brown, about 20-25 minutes more. Transfer to a wire rack and let cool slightly, then remove the pan rim. Sprinkle with powdered sugar (optional) and serve. This would work beautifully with apples instead of pears. Can be made up to 2 days ahead. Let it come to room temperature before serving. Thank you! Yes, Pear and ginger is such a nice combination. Yay nerds!